STUTTGART (Bloomberg) -- Porsche Automobil Holding SE investors approved plans for a 5 billion euro ($6.5 billion) stock sale to reduce the sports car maker's debt as it prepares to combine with Volkswagen AG. Shareholders at the company's annual meeting voted in favor of raising the funds, half of which will come from the Porsche and Piech families, who control the common stock. Of preferred shareholders voting, 88 percent supported the measure, the carmaker said late Tuesday. Porsche agreed to combine with VW in August 2009 after a failed attempt by Porsche to gain control of VW. Proceeds from Porsche's share sale, which the company aims to complete by May 30, will be used to help pay back a 2.5 billion-euro bank loan expiring at the end of June. Porsche racked up more than 10 billion euros of debt in its unsuccessful attempt to control VW. 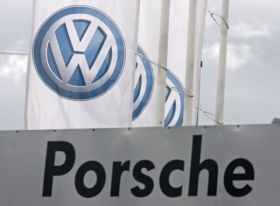 Volkswagen now owns 49.9 percent of Porsche's carmaking operations. Costs linked to Porsche's purchase of VW stock in the takeover bid led to two consecutive years of net losses. Holders of common stock unanimously backed the capital increase at Tuesday's meeting. The vote needed the approval of 75 percent of common and preferred shareholders present to pass. The deadline for the share sale would be extended until Aug. 30 should any investor lawsuits against the carmaker result in a delay, Chief Financial Officer Hans Dieter Poetsch said. “The capital increase should prove a decisive step to reduce our company's liabilities,” said Poetsch, who also holds VW's top finance post. Even though shareholders backed the capital increase, the merger, originally scheduled for completion in the second half of 2011, may stall until the resolution of tax disputes in Germany and lawsuits in the U.S., Winterkorn said. U.S.-based short sellers of VW stock have sued Porsche, claiming the carmaker secretly piled up VW shares and later caused the investors to lose more than $1 billion. A U.S. court will determine in January whether the case may proceed.